The Traffic police is on their toes since the past 4 days and has collected over 12 Lakhs in fine mainly for non wearing of helmets. Each day about 2500+ cases are been put and fine is being collected. But the citizens at large who are happy with the move that helmets must be worn which for their safety only, but why dont the traffic police also see the Auto Rikshaws which are flouting all the rules. The District judge has instructed to take action so that there is smooth flow of traffic and law is adhered to. Then why is that the police are behind in getting the autos to run by meter, a rule which they have to follow. Implenting the Auto meters in Belagavi has never been successful, DC N Jayram tried a bit but the RTO did not respond and the entire exercise was a utter failure last time. Even the fare was increased as per the Auto union demand but no one still applies the meter? The pre paid auto counters at Railway station, Nehru nagar and CBT are just monuments. 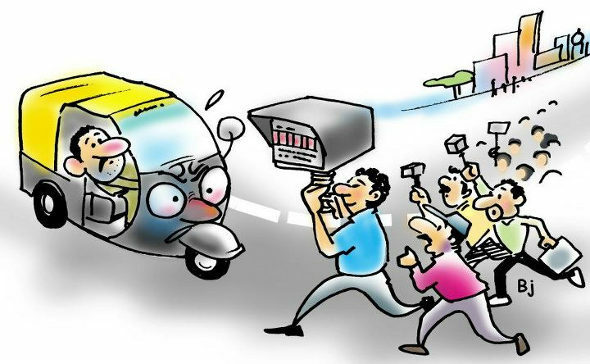 Sources have told AAB that DCP Crime, Amarnath Reddy and his team will also start fining the autos who flout the rules from Monday. We just hope that the Good sense prevails and the Lord will give the Cops the courage and the strength to break this AutoCracy. Facing problems by hawkers standing on the road and not hearing by home guards. The traffic police should be posted all the times.